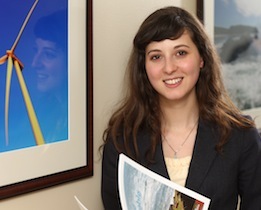 I initially started as an intern at the Department of Energy through the MPA Program. I was rehired on a part-time basis in the fall after my internship ended to continue the work I was doing during my internship. I began my work full-time upon completion of my studies. I have since competed and was successful in a separate competition for a policy analyst position within the same group on a different file. I am now focused on marine renewable energy development and regulation in the province. What skills did Dal help you develop? The Dal MPA program helps by providing a theoretical understanding of government systems and procedures, etc. (particularly in the first year) along with a practical application of this knowledge (particularly in the second year). This allows students to practice what they have learned, while gaining applicable experience for work in the public or not-for-profit sectors. What’s your next big career goal? I hope to continue in a policy function, providing regulatory support and working in regulatory development, in the near-future. My next goal would be to move into more senior policy positions with more project and personnel management experience, while gaining valuable experience to help me with my longer-term career goals. How was your experience in the MPA internship program? The internship is a key component of the MPA Program and should be taken by all students. It effectively introduces you to government hiring practices before graduation and allows students to apply knowledge gained in the first year of the program in a real-world setting. In addition, the work experience provides value in the second year of the program when internship experiences can be brought into the classroom. Read more about Melissa's internship and current position with the NS Department of Energy in English to Energy on Dal News.